When you are choosing a commercial cleaning company to take care of your business, you have a number of choices available to you. One of the best options to look for when you are choosing one of these companies, however, is to find a company that can offer eco-friendly commercial cleaning services. While you might have been going green at home, now is the time to make sure that you are making your business as green as possible, too. Consider for a moment all of the typical types of chemicals that are used in cleaning different types of buildings. Imagine all of those chemicals just going right into the water supply. It makes sense to do your part to curb these types of activities, and choosing a green cleaning company is one of the best and simplest ways to do it. You will find that they are only going to cost about the same as a traditional cleaning company, too. 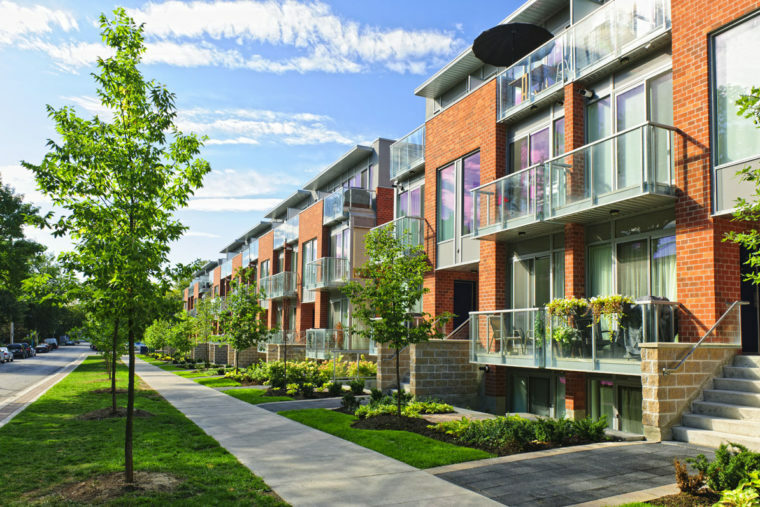 A company that offers eco-friendly commercial cleaning will utilize products and offer services that are going to have less of a negative effect on the environment, and a more positive effect on the health of those in the building. Not only will they be using safer products for cleaning, but these products are less likely to cause issues with the health of the employees you have working for you since they do not contain hazardous materials. Many of the traditional cleaning products that people still tend to use will have ammonia, bleach, and other chemicals in them. These products can cause irritation to the skin and the eyes, as well as respiratory problems in some people. It is even possible to mistakenly ingest these materials if there is any residue left on areas where people prepare food. These are the same types of chemicals that will damage the environment if they were to be flushed down the drain. Keep in mind that the products themselves are not the only dangerous elements to them. In addition, the packaging materials, such as plastic, that is used for many of these cleaners and other products could end up in the ground or just filling up a landfill somewhere. A company that is truly eco-friendly will make sure that they are taking care of their waste and recycling it properly rather than just filling up the trash cans. You will find many companies out there that might claim to be green, but many of them are just using that for their marketing. They do not really have any sort of plans in place that make them truly green and eco-friendly. Therefore, when you are looking at various companies offering cleaning services, you might want to ask them just what it is about their company that makes them so green. What types of products are they using, and how much have they been able to cut down on waste? Just because a company is eco-friendly, it does not mean they are going to charge more for their services. In fact, you will find that the cost between green and non-green companies tends to be quite comparable. Therefore, do not let your cleaning budget dissuade you from going green. Of course, when you are hiring a cleaning company, you need to do more than just make sure they are fully green. You also must be sure they have a good reputation in the field and that they can deliver on their promises of properly cleaning your commercial space, no matter what it might be. One of the side benefits of working with an eco-friendly commercial cleaning company is the fact that you can advertise that you hired a green cleaning company for your business. Since so many people today are going green themselves, they may be more likely to patronize your business rather than your competitors who still uses traditional cleaning methods. With all of the benefits that working with a green cleaning company can offer, there’s no reason not to find one located in your area who can provide you with a great service while making sure the environment is kept just a bit safer. Hire a quality cleaning company that offers Green products, like Red Door Cleaning Company in Edmonton. You want to keep your business looking great, naturally, and you know you need to have your carpets cleaned regularly. However, most people have no idea of just how often they should have their carpets steam cleaned. It truly depends on the type of business you are running and the amount of foot traffic that you tend to have through the business. Let’s look at some loose guidelines that you can follow. Those who have a retail store that gets a lot of customers through the doors are likely going to want to have their carpets steam cleaned at least once every three to six months, depending on the number of visitors. Those who run a restaurant or a bar will find that more frequent steam cleanings are needed – about once a quarter. This is because people tend to spill food and drink in these areas more frequently. 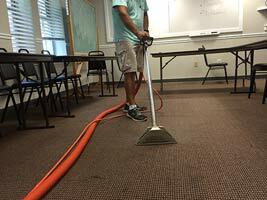 Office buildings should have their carpets steam cleaned about once every six months to ensure they stay looking great. It can also depend on the location and the time of the year. Those who are running a business in an area that might get a lot of rain or snow are more likely to have people tracking mud and slush into the building; and would necessitate more frequent steam cleanings, naturally. Here in Edmonton, with snowy winters, and muddy springs, businesses tend to require more frequent steam cleanings. Of course, these are just some guidelines, you might find that you have more spills in your office or restaurant and you might need to have the cleaning done more often, for example. Medical clinics, whether it is a dentist’s office, a general health clinic, or any other type of medical care facility, thrive on cleanliness. It is necessary for the health of the patient. Even though you likely have a trained staff, they can only spend so much of their time cleaning. They also have to take care of patients, get rooms ready for the next patient, take down appointments, answer the phones, and more. It is a good idea to have a professional cleaning company provide you with a full cleaning service conducted after the regular hours of the clinic, or who can work throughout the day. Of course, you need to make sure you are working with the right janitorial company when it comes to cleaning medical clinics. The professional cleaners can come into the facility when the patients are not there, allowing them to fully clean the clinic. Red Door Cleaning overnight janitorial staff will clean your clinic, making sure it is clean while the clinic is closed. These facilities often have private patient information, so you need to choose only those companies that ensure their workers understand the need for confidentiality and security. All Red Door Cleaning staff have full background checks and are all guaranteed bondable. Make sure the janitorial company can accommodate your needs, and clean the types of workspaces you have. After all, cleaning an examination area is far different from cleaning a doctor’s private office or the billing office, for example. A great cleaning company can clean the floors, walls, and other areas of the rooms without disturbing your equipment and tools, and they will take the time to do the job right so when your clinic opens in the morning, everything is nice and clean. Red Door Cleaning follows cleaning checklists to ensure that the cleaning is done well, and nothing is missed. Find a company that can offer good prices, and can ensure you that their employees will be there each day/night to perform the cleaning services you need. A good reputation can go a very long way in this field, so make sure you take the time to find a company that can meet and exceed your expectations. 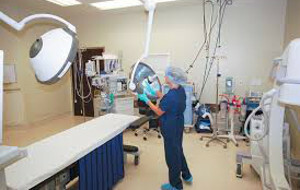 Contact Red Door Cleaning for your medical office Janitorial quote.